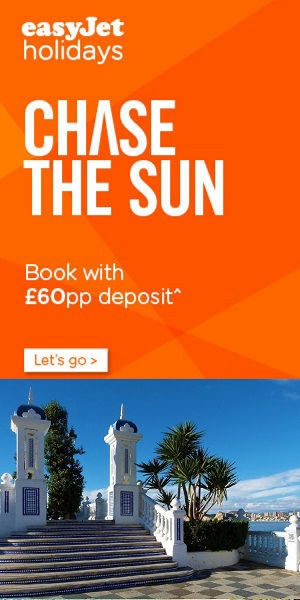 easyJet Holidays: Combine any fligth with a hotel to build your won Package Holiday in Benidorm. Combine an Alicante flight with a 3 to 5 star hotel or self cheap catering apartment for great value holidays in Spain. With a huge number of daily flights from the UK easyJet best selling Benidorm holidays combine any easyJet flight with a big choice of accommodation in Benidorm. All nicely packaged into a holiday, weekend or short break. Stay from 2 to 28 nights, long or short YOU decide. Add extras like luggage and transfers if you want them. Find a last minute Costa Blanca bargain check out the easyJet holidays last minute offers departing within the next six weeks and a soon as this week! Enjoy a three night weekend or mid-week break in Benidorm out of season from as little as £149 room only including a flight with cabin baggage. 10 REGIONAL AIRPORTS - easyJet fly to Alicante from 10 regional UK airports. Benidorm holidays depart from: Belfast or Bristol. Liverpool London: Gatwick, Luton and Southend or from Manchester, Newcastle and in Scotland: from Edinburgh or Glasgow. PICK N MIX IT UP - Once you have chosen your hotel and flight combination you can then add in optional stuff like, hold-luggage, choose a seat and add a transer. It is up to you, no need to pay for things you do not want just the bits you really need! LAST MINUTE - Book a last minute getaway to Benidorm departing soon. Tons of incredible holidays at the best hotels in Benidorm flying from 10 regional airports. Choose your departure airport for Benidorm last minute final late escapes. Grab a last minute bargain holiday to Benidorm with easyJet holidays. These are the best final deals departing within just a few days or few weeks from up to 10 regional airports. BENIIDORM HOLIDAYS Final late deals departing Belfast BFS. BENIDORM HOLIDAYS Final late deals departing Bristol BRS. BENIDORM HOLIDAYS Final late deals departing Edinburgh EDI. BENIDORM HOLIDAYS Final late deals departing Glasgow GLA. BENIDORM HOLIDAYS Final late deals departing Liverpool LPL. BENIDORM HOLIDAYS Final late deals departing London Gatwick LGW. BENIDORM HOLIDAYS Final late deals departing London Southend SEN.
BENIDORM HOLIDAYS Final late deals departing London Luton LTN. BENIDORM HOLIDAYS Final late deals departing Manchester MAN. BENIDORM HOLIDAYS Final late deals departing Newcastle NCL.